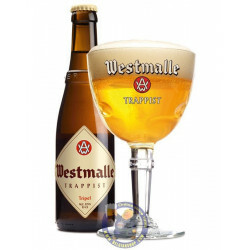 The golden Tripel made by Westmalle has in recent years inspired countless imitators, though few match its complexity. The abbey’s full name is Our Lady of the Sacred Heart. 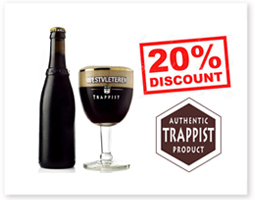 It sits behind elm trees and high walls in neat, flat, countryside near the village of Westmalle, north of Antwerp. 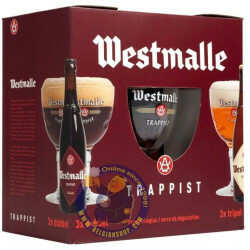 The monastery was founded in 1794, and is said to have been brewing beer for the brothers’ own consumption since 1836, though the product was not sold until the 1870s, and initially only in the village. Most of the present abbey edifice dates from around 1900. By the 1920s, the making of beer had become a commercial business, and the brewhouse building itself is strikingly 1930s in style. Inside, the vessels are copper, set into platforms tiled in a decorative pattern of blue, black, red and autumnal colors. The brew-kettle is heated by direct gas flame, rather than steam, which is more common. This “fire-brewing”, as it is sometimes known, produces hot spots in the kettle, and these very faintly caramelize the malt. 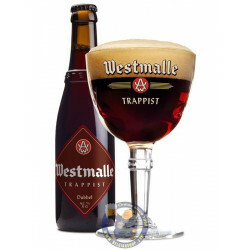 This produces a hint of a toffee-ish, aromatic, quality that is a traditional feature in some Trappist beers. 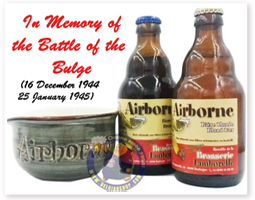 The look of the brewhouse did not change dramatically in an upgrade in 1991/2, though a vessel was effectively gained by the addition of a mash-filter to replace a lauter-tun. There are now two brew-kettles, but the system of heating by (gas) direct flame has for the moment been retained. The brewery feels, rightly in my view, that this system may contribute to the malt character of its beers, but worries about the wear on the underside of the kettles. Experiments have been carried out with a steam system. The brewery produces three beers: “Single”, “Double” and “Triple” beers. The single, actually known as Extra, is also a golden beer, delightfully delicate in character. It is very dry, and to my palate slightly salty. The brewery’s water is quite hard, which suits the paler ales. The Extra is usually produced at a modest strengths for the monks’ own consumption, but it has been made n more than one version, and at a higher potency been marketed outside the abbey. 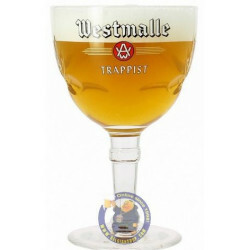 Westmalle does produce the occasional experimental beer.